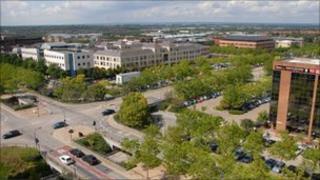 People living in Milton Keynes get the slowest 3G mobile broadband speed in the UK, according to new research. The average speed for mobile broadband in the Buckinghamshire town was 1.73Mbps (megabits per second), compared to 3.6Mbps in Peterborough, the fastest town. Mobile speeds are increasingly crucial to users as smartphones become ubiquitous. The data was compiled by broadband comparison website Top10.com. It analysed thousands of 3G speed tests carried out by users of its Streetstats 3G app. The app is only available for the iPhone, meaning the data only looks at speeds available via Apple's handsets. At 1.73Mbps it would take up to 10 seconds to load a webpage and over two minutes to download an app such as the popular Angry Birds game. Birmingham, Liverpool and Cardiff also featured in the slowest 10 towns, according to its research. Alex Buttle, director of Top10 said: "There's clearly a disparity when it comes to 3G connectivity across the UK. Despite efforts by the government and mobile operators to increase the speed of 3G services, there is evidently still a long way to go." The fastest UK town according to the data was Peterborough with an average of 3.86Mbps. It was followed by Carlisle (3.5Mbps), Eastbourne (3.47Mbps) and Stoke (3.35Mbps). Other towns in the top 10 included York, Dundee, Brighton, Derby and Reading - all offering speeds over 3Mbps. Some coverage may have improved since the survey was carried out, as O2 has recently begun to use portions of their radio spectrum, previously reserved for voice, to add extra 3G capacity. Vodafone is also expected to switch over parts of the 900MHz range. Next year the government will auction off further radio spectrum allowing mobile operators to introduce faster 4G services. UK telecoms regulator Ofcom is due to publish its own study of mobile broadband coverage later this month.